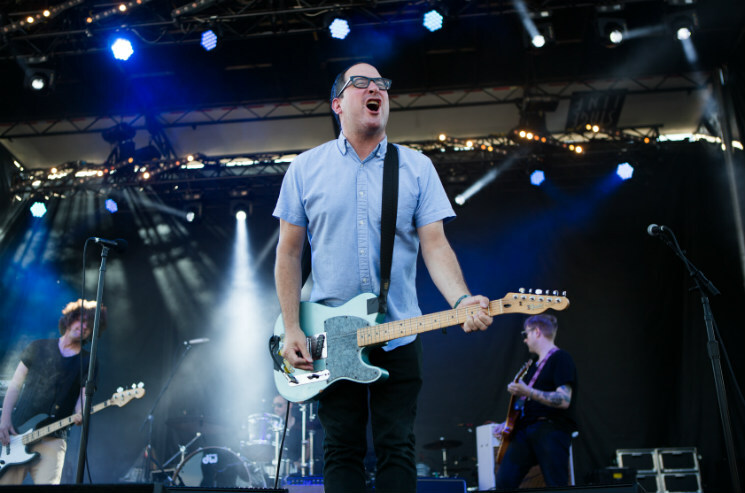 Fully ten years after their breakthrough LP Boys and Girls in America, Brooklyn's the Hold Steady have taken to the road to remind people just how good that record remains. For their mid-afternoon set under a cloudless sky, the band offered their wildly devoted sing-every-single-word-with-fists-pumping fans a treat: the entire album front to back, followed by a smattering of their best songs from before and after. It's a killer formula for bands now into their second decade of touring: play the fans' favourite album and then relax and do what you like. What you lose in anticipation and suspense (since everyone knows what song's up next), you gain in fan appreciation. All around me the crowd was jubilant, celebratory and grateful. Although there were a few missed cues, and the band seemed a bit bored — at times (even while playing!) bassist Galen Polivka and lead guitarist Steve Selvidge seemed keener on sharing some joke than engaging with the audience — it didn't matter much to anyone in attendance. And anyway, frontman Craig Finn is a live wire at centre stage, picking up any slack the others might have dropped. By the time they had finished with BAGIA and moved on to the cuts from other records, the party was in full sprint. "The Swish," "Constructive Summer" and the inevitable (but still glorious) "Your Little Hoodrat Friend" carried the show home.